Drew Duffy ’21 has been sensational for Dartmouth in his debut season, with four wins in six races. The collegiate carnival scene might be new to him as of this year, but he’s certainly not wanting for experience. Before coming to Dartmouth, Duffy skied for the U.S. team, racing on the North American Cup, Europa Cups and even the World Cup circuit. He credits his experiences in higher level racing with giving him an edge as he returns to the carnival racing arena. One standout moment in his pre-Dartmouth career was his 2015 super-G win at U.S. nationals. This triumph was made all the more exceptional by the fact that Duffy, seeded second after a slump in his racing career, raced from bib number 30. This placed him behind any skier favored to win and gave him a rougher course to follow, likely skied-off by those skiing before him. “I was kind of an underdog in that race,” Duffy said. “I didn’t expect to win, I just wanted to get top 10.” But win he did, shocking spectators who’d assumed the race had already been won by the man with bib 7, Olympian and World Cup racer Steve Nyman. Duffy beat Nyman’s time by 0.04 seconds. It was an incredible end to what had been a particularly hard season for Duffy. Earlier that same year, while training in Austria, he was taken down in an avalanche that killed two of his close friends and unsurprisingly traumatized his season. In the races following the event, Duffy’s results were disappointing at best, as he failed to finish most of them. His ability to recover from this tragedy for a fairytale win at nationals speaks to the tremendous mental strength the sport demands of all its stars. Beyond his obvious physical skill at skiing, men’s alpine coach Peter Dodge ’78 and Duffy’s teammate Kalle Wagner ’21, cite this mental strength as a major asset of Duffy’s. A good portion of ski racing is mental. The ability to understand the more intangible components of the race inside and out only comes with the kind of experience Duffy has. His career on the U.S. national team showed him how to ride the ups and recover from the downs of the sport, and he’s learned how to stay level-headed on race days. Though the team aspect of the sport is somewhat new to Duffy, as skiing is largely an individual sport aside from the college level, both Dodge and Wagner have seen the positive impact of his contributions to the team. In particular, his wealth of experience, being greater than that of the average collegiate skier, provides his teammates with a valuable perspective on the sport. Members of the ski team are in regular competition with each other — toward the end of the season, only five skiers will travel to each carnival — but they’re also motivated to help each other improve. A team with just one star won’t threaten for an Eastern Intercollegiate Ski Association title, and Dodge’s guys are constantly pushing each other to reach new levels. Duffy has adjusted quickly. “The camaraderie, the way the guys work together, I think Drew really likes that, and that’s helping him ski faster,” Dodge said. Duffy’s path to the Big Green ski team started at a young age. He comes from a family full of talented skiers. His parents met at Loon Mountain in New Hampshire, and the rest, as they say, is history. Growing up, Duffy and his siblings would spend the weekends skiing at Mad River Glen, eventually joining a racing program with some close friends. The family moved to Vermont, where Duffy and his brother and sister attended Green Mountain Valley School, a well-known ski academy in Waitsfield, Vermont near Sugarbush. 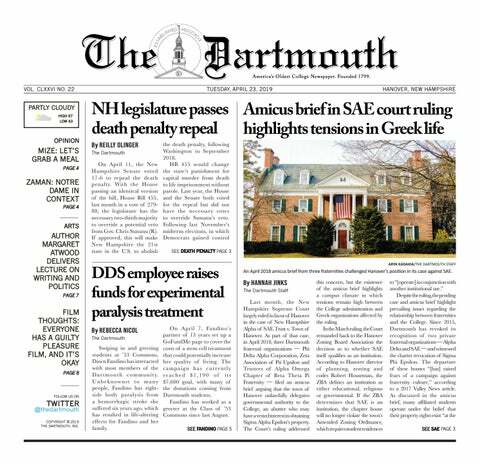 It was there that he heard about Dartmouth from the school’s staff, many of whom attended Dartmouth or Middlebury College, two of the top ski schools in the east. “The quarter system offers for ski racers something that no other college offers — the spring term lines up perfectly with when our season ends,” Duffy said. This is a great opportunity for athletes who foresee a skiing career outside of school, at World Cup races or with the national team. Cut from the national team last year, Duffy said, “I was in a great spot to join the Dartmouth ski team and still pursue skiing at the level that I wanted to.” He is not the only skier from the national team to end up skiing for the Big Green this season. Kipling Weisel ’18 is another former U.S. skier joining Dartmouth for his first season this year.